Bank robberies no longer have the glamour of Bonnie and Clyde. The FBI reports that there were fewer than 4,000 robberies in 2012, according to Fox 40 Sacramento. That’s compared to 9,400 bank robberies in 1991. 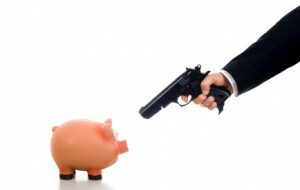 Robbers also are taking off with less money, $7,600 per heist in 2012. By contrast, each robbery netted $12,400, Fox 40 reported. Posted: 6/11/13 at 9:01 AM under FBI, News Story.